Terpenes in essential oils are easily oxidized and can cause a decrease in the flavor in foods. Removal of Terpenes is commonly practiced in perfume industry to yield higher quality oils. Natural spearmint oil contains l-limonene that is quite unlike d-limonene, the aroma is not reminiscent of citrus but of a light, clean Terpene hydrocarbon fragrance. Conventionally, Terpenes are removed using vacuum distillation. However, it is difficult to monitor the fractionation process in real-time during this process. We used SFC with a PDA detector and an FTIR spectrometer as a dual monitoring system to enable selective monitoring of the target compound Carvone in real time during elution and fractionation. The PDA provides broad information on the separation, but cannot differentiate between limonene and Carvone. Figure 1. Structures of Carvone and Limonene. d-carvone is present in caraway oil while l-carvone is present in spearmint oil. They are easily differentiated by the nose. d-limonene is present in citrus oils while l-limonene is present in spearmint oil, pine oil, etc. It is desirable to remove l-limonene from spearmint oil. Figure 2. UV and IR Spectra of Limonene and Carvone Standards. Figure 2, Limonene and Carvone have very similar UV spectra, but show differences in the IR. Co-elution in the chromatogram detected using UV as shown in figure 3 and 4 illustrates the inability of using UV to trigger fraction collection. Figure 5 shows IR chromatograms at two different wavenumber ranges and the fractions collected using those chromatograms. A Carvone standard and Spearmint oil were separated using HPLC and fractions 1 and 2 were compared to confirm the separation and purity as seen in Figure 6. Figure 3. PDA Contour Plot of Spearmint Oil. The PDA could not differentiate limonene from carvone due to apparent co-elution. Therefore fraction timing could not be set based on the PDA. Figure 4. SFC Chromatograms of Spearmint Oil by PDA Detection. Figure 5. IR Chromatogram of Spearmint Oil used for Fractionation. HPLC Conditions: Column: Crestpak C18S, Mobile Phase: CH3CN/H2O 60/40 Flow rate: 1.0mL/min, Column Temperature: 40°C. 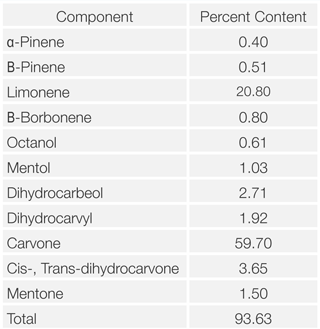 The carvone content in the original spearmint oil (62.7%) was successfully enriched to 89.1%. During the fractionation process the limonene peak was clearly detected using FTIR and was easily removed as fraction 1. HPLC was used to analyze the purity of the two fractions and confirmed the removal limonene from the spearmint oil.